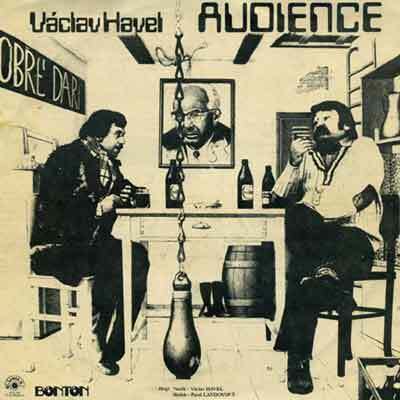 This is the legendary 1978 samizdat recording of Audience, starring Václav Havel (1936-2011) as Vanek and Pavel Landovský as Sládek. It was recorded by folk singer Vladimír Merta in his Prague appartment in 1978 and published by the Šafrán label, ran from Upsalla, Sweden, by Czech exiles Jirí Pallas and Jaroslav Hutka, both signatories of the Charter 77. The LP was unofficially circulated in Czechoslovakia and many Czechs knew parts of the play by heart after 1978, despite the fact any Havel publication was banned in the country since the 1968 Soviet invasion. Havel himself was briefly imprisoned in 1978 and continuously from June 1979 to January 1984. This is a rare example of a record which proved dangerous for its authors, as well as for the entire Soviet system. Czech record company Bonton officially published the recording for the first time in 1990, soon after Havel became president of Czechoslovakia in December 1989. Václav Havel and Pavel LandovskýAudience (as it is titled in Czech) belongs to a trilogy of partly autobiographical one-act plays also known as the Vanek Trilogy, comprising Audience (1975), Protest (1978) and Mistake (1983), based on Havel’s experience of being forced to work in a brewery and under constant harassment from the Communist regime. Taking place in the brewery’s office, Audience is a meeting between the brewery’s manager Sládek and employee Vanek. While the manager is clearly opening too many beers and inducing into binge drinking, it is less clear what he wants from Vanek, though it ultimately transpires he has a deal to offer: a promotion agaisnt informations on Vanek’s political activities. A transcript of the play in Czech is available as PDF here. A short synopsis here. See also Havel’s biographer Carol Rocamora’s analysis of these one-act plays here. Altered images on the front and back cover of this LP allude to the Communist regimes’s habit of altering and falsifying photographs. Framed Czechoslovakia president Gustáv Husák is letting his eyebrows grow thick ala Brejnev, an allusion to his allegiance to the Soviet regime. In 1975, Havel addressed a letter to Husák, pleading for more democracy in the country. First broadcast on BBC Radio's Third Programme 9th December 1966. Source: tape recording of broadcast material. The Memorandum (VyrozumenÌ) written 1966, is one of the best known and most popular plays by Czechoslovaki's (later the Czech Republic's) best known playwright, Vaclav Havel. Inspired by the absurdities of life in Eastern Europe under Communism,like much of Havel's writing, The Memorandum is political, at least implicitly. The play concerns the tribulations of Josef Gross, the managing director of an organization encumbered by a bureaucracy that is out of control. The introduction of an artificial language, Ptydepe, is supposed to streamline office communications, but only makes it worse. Havel's satire is full of irony about the kind of jobs created by communism as well as the constant surveillance by office spies. Though Havel's vision was informed by his observations many critics have noted that the office politics depicted can be found around the world. The importance of conformity to keep one's job is seen as relatively common. As Michael Billington of The Guardian wrote,"The play may have grown out of experience of Czech communism; its application, however, is universal." Ptydepe was constructed along strictly scientific lines, with none of the messiness and ambiguity of natural languages. In order to be able to express precisely all the subtle and easily-misunderstood nuances of natural language, Ptydepe has an extraordinary large vocabulary. Another problem of natural language that Ptydepe was intended to eliminate is the frequent similarity of unrelated words, or homonyms. To entirely avoid the possibilities for confusion that arise with homonyms and similar unrelated words, Ptydepe was created according to the postulate that all words must be formed from the least probable combinations of letters. Specifically, it makes use of the so-called "sixty percent dissimilarity" rule; which states that any Ptydepe word must differ by at least sixty percent of its letters from any other word consisting of the same number of letters. This led to the necessity of creating some very long words. The inevitable problem of pronounceability is solved by breaking very long words up into smaller clusters of letters called "subwords", which nonetheless have no meaning outside of the word they belong to and are not interchangeable. Length of words, like everything else in Ptydepe, is determined scientifically. The vocabulary of Ptydepe uses entropy encoding: shorter words have more common meanings. Therefore, the shortest word in Ptydepe, gh, corresponds to what is so far known to be the most general term in natural language, "whatever". (The longest word in Ptydepe, which contains 319 letters, is the word for "wombat".) Theoretically an even shorter word than gh exists in Ptydepe, namely f, but it has no meaning assigned and is held in reserve in case a more general term than "whatever" is discovered. Translation: not available, as it was impossible to ever get the memorandum fully translated within the rules of the official Ptydepe Translation Center of the office. It was translated in part in the second-to-last scene of the play, but considering the trouble its translation caused, it would be better for all concerned if the partial translation is not reproduced here.